Origin: Southeast of the United States (Florida notably), Mexico. 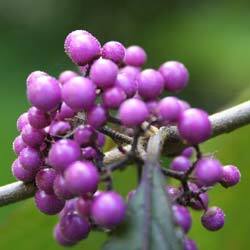 Habitat: Bodinier's Beautyberry prefers sunny or slightly overshadeed positions, and sheltered from the wind. It is not demanding in soil provided that it is well drained. It grows under pines (few shrubs accept this situation). Hardiness: zone 6 (it supports cold until -23 °C or -9 °F). Bodinier's Beautyberry grows well in Paris region. Shape: irregular, with arching tomentose branches. Deciduous, elliptical, fine leaves, of 8-12 cm, medium green, with a finely toothed margin. They are arranged opposite. Flowers: very small, rose-lilac or purple, abundant (the shrub is said "floriferous"), in June. They are grouped in bowl. Variety 'Abundance ' is even more floriferous. Fruit: small drupes (Ø 4 mm) grouped, tight as a whole protruding, a bit as the mulberry. Their colour bright purple as some porcelain or child's pearls (in German " Liebesperlenstrauch ", "shrub with pearls") is remarkable. Variety Lactea has white fruits. They appear in October. Birds feed on it. 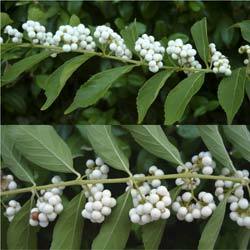 Use: Bodinier's Beautyberry is a nice shrub or hedge shrub. Bodinier's Beautyberry must be planted in group (2 subjects at least) to assure the fertilization of flowers. Thus, berries will appear from October and will delight your garden until December. The contrast color of the fruit is most striking in the vicinity of evergreen shrubs or trees.